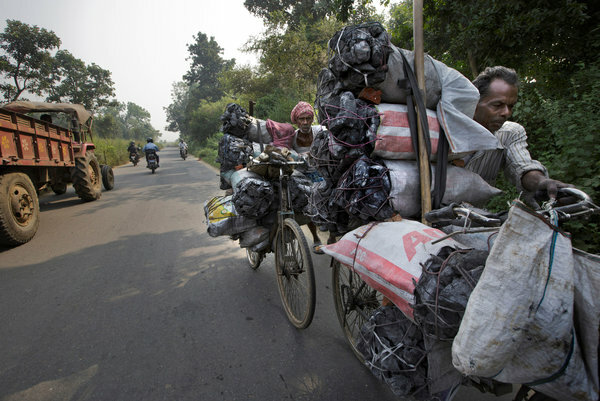 DHANBAD, India — Decades of strip mining have left this town in the heart of India’s coal fields a fiery moonscape, with mountains of black slag, sulfurous air and sickened residents. But rather than reclaim these hills or rethink their exploitation, the government is digging deeper in a coal rush that could push the world into irreversible climate change and make India’s cities, already among the world’s most polluted, even more unlivable, scientists say. India’s coal mining plans may represent the biggest obstacle to a global climate pact to be negotiated at a conference in Paris next year. While the United States and China announced a landmark agreement that includes new targets for carbon emissions, and Europe has pledged to reduce greenhouse gas emissions by 40 percent, India, the world’s third-largest emitter, has shown no appetite for such a pledge. Prime Minister Narendra Modi has also vowed to build a vast array of solar power stations, and projects are already springing up in India’s sun-scorched west. But India’s coal rush could push the world past the brink of irreversible climate change, with India among the worst affected, scientists say. Indian cities are already the world’s most polluted, with Delhi’s air almost three times more toxic than Beijing’s by one crucial measure. An estimated 37 million Indians could be displaced by rising seas by 2050, far more than in any other country. India’s megacities are among the world’s hottest, with springtime temperatures in Delhi reaching 120 degrees. Traffic, which will only increase with new mining activity, is already the world’s most deadly. And half of Indians are farmers who rely on water from melting Himalayan glaciers and an increasingly fitful monsoons. India’s coal is mostly of poor quality with a high ash content that makes it roughly twice as polluting as coal from the West. And while China gets 90 percent of its coal from underground mines, 90 percent of India’s coal is from strip mines, which are far more environmentally costly. In a country three times more densely populated than China, India’s mines and power plants directly affect millions of residents. Mercury poisoning has cursed generations of villagers in places like Bagesati, in Uttar Pradesh, with contorted bodies, decaying teeth and mental disorders. T. K. Lahiry, chairman of Bharat Coking Coal, a government-owned company that controls much of the Jharia region, denied neglecting fires and pollution but readily agreed that tens of thousands of residents must be displaced for India to realize its coal needs. Evictions are done too slowly, he said. “We need to shift these people to corporate villages far from the coal fields,” Mr. Lahiry said during an interview in his large office. 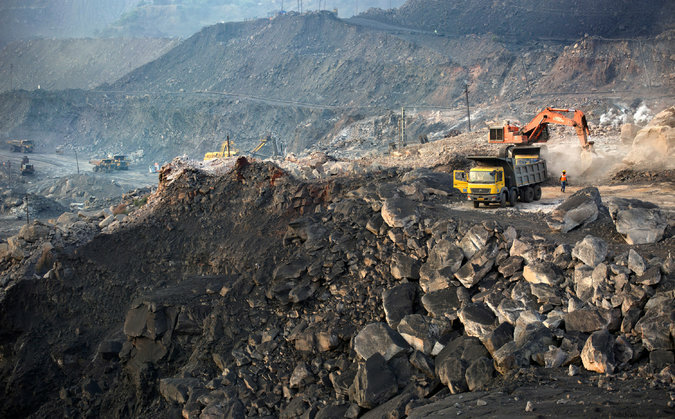 With land scarce, Bharat Coking is digging deeper at mines it already controls. On a tour of one huge strip mine, officials said they had recently purchased two mammoth Russian mining shovels to more than triple annual production to 10 million tons. The shovels are clawing coal from a 420-foot-deep pit, with huge trucks piling slag in flat-topped mountains. The deeper the mine goes, the more polluting the coal produced. India has the world’s fifth-largest reserves of coal but little domestic oil or natural gas production. The country went on a coal-fired power plant building spree over the last five years, increasing capacity by 73 percent. But coal mining grew just 6 percent, leading to expensive coal imports, idle plants and widespread blackouts. Nearly 300 million Indians do not have access to electricity, and millions more get it only sporadically. Each Indian consumes on average 7 percent of the energy used by an American, and Indian officials dismiss critics from wealthy countries. “I don’t want to use the word ‘pontificate’ when talking about these people, but it would be reasonable to expect more fairness in the discussion and a recognition of India’s need to reach the development of the West,” Mr. Goyal said with a tight smile. One reason for the widespread domestic support for India’s coal rush is the lack of awareness of just how bad the air has already become, scientists say. Smog levels that would lead to highway shutdowns and near-panic in Beijing go largely unnoticed in Delhi. Pediatric respiratory clinics are overrun, but parents largely shrug when asked about the cause of their children’s suffering. Face masks and air purifiers, ubiquitous among China’s elite, are rare here. And there are signs Indian air is rapidly worsening. “People need to wake up to just how awful the air already is,” said Rajendra K. Pachauri, chairman of the Intergovernmental Panel on Climate Change, the world’s leading intergovernmental organization for the assessment of climate change. India’s great hope to save both itself and the world from possible environmental dystopia can be found in the scrub grass outside the village of Neemuch, in India’s western state of Madhya Pradesh. Welspun Energy has constructed what for the moment is Asia’s largest solar plant, a $148 million silent farm of photovoltaic panels on 800 acres of barren soil. Welspun harvests some of the most focused solar radiation in the world. Dust is so intense that workers must wash each panel every two weeks. Under Mr. Modi, India is expected to soon underwrite a vast solar building program, and Welspun alone has plans to produce within two years more than 10 times the renewable energy it gets from its facility in Neemuch. The benefits of solar and the environmental costs of coal are so profound that India has no other choice but to rely more on renewables, said Dr. Pachauri. “India cannot go down China’s pathway, because the consequences for the public welfare are too horrendous,” he said. A version of this article appears in print on November 18, 2014, on page A4 of the New York edition with the headline: Coal Rush in India Could Tip Balance on Climate Change.